Our Temporary Floor, Carpet, Window, Glass & Surface Protection materials allow you to prepare your job sites quickly and professionally and prevent costly clean ups and prevent damage to your customers floors and surfaces saving you potentially thousands of pounds and your valuable time. We will beat any UK price, call now on 01268 768 768, what are you waiting for? Builders Board® super heavy duty 1.2mm thick board, breathable floor protection is ideal for all floor and surface protection including newly laid screed floors as it still allows it to breathe. Unlike most card protectors builders board is water and spill resistant! Buy all your DPM Damp Proof Membrane Polythene Sheeting Films direct from Indigo. Thousands of Builders and Contractors trust us across the UK and Worldwide. All our Films are branded and manufactured right here in the UK, plus we back up all our super low prices with a Price beater Guarantee, tell us what you pay, we will beat it* Call 01268 768 768 Now. Our surface protector pads stop scratching and slipping on many surfaces! Contractors, Builders can't go wrong with our tried and tested range of Temporary Floor, Carpet, Window & Surface Protection Materials you can stop the mess and damage caused to floors when any type of construction or building work is taking place. Call us on 01268 768 768 for free advice and samples. Protect corners, edges and more with our range of protective foam products. TEMPRO® stock many types of polythene sheeting rolls including DPM (damp proof membrane) films and polythene for packaging and protection purposes. We can manufacture to your exact specifications, subject to a minimum order quantitiy. All made in the UK. StickyShield® the award winning range of colour coded, self adhesive protection films. Protect carpets, floors and windows from the dust, debris and mess caused during building work, refurbishment and decorating. "much safer than dust sheets"
Windows and glass are hard to clean areas but also attract dust and debris. Using our window and glass protection products will save you valuable time in preparation and cleaning up plus the cost of replacing damaged surfaces. 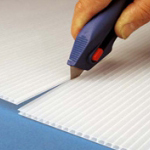 Products include our self adhesive protection films and tape, plus dust sheets, corex correx corrugated plastic, polythene sheeting rolls and many more suitable products. Please call us for advice on 01268 768 768 and remember we will beat any uk price!